The study, led by UCLA Jonsson Comprehensive Cancer Center members Dr. Paul Tumeh and Dr. Antoni Ribas, primary investigator of pembrolizumab, is the first of its kind since the U.S.Food and Drug Administration approved its use under the name Keytruda in September, and it could lead the way for more effective use of the drug in patients with melanoma and other cancers. A protein known as PD-1 puts the immune system’s brakes on, preventing T cells from attacking cancer cells. Pembrolizumab removes the brake lines, freeing up the immune system to kill cancer cells. During the two-year study, Tumeh and Ribas analyzed 46 patients with advanced melanoma who were treated with pembrolizumab and who underwent tumor biopsies before and during treatment. They analyzed the biopsies and classified them according to whether the patient responded or not to pembrolizumab. In collaboration with Dr. David Elashoff, UCLA Jonsson Comprehensive Cancer Center member and adjunct professor of medicine, the information allowed them to develop an algorithm that could predict the likelihood of treatment success or failure. Fifteen additional tumor samples were obtained from patients given pembrolizumab in Paris, without Ribas’ team knowing what the clinical outcomes were. After applying their predictive algorithm Tumeh correctly predicted what would happen in 13 out of the 15 patient cases. Keytruda was the first PD-1 immunotherapy drug approved by the FDA and there are eight others currently in clinical development. 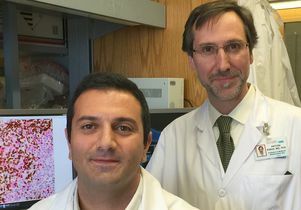 Ribas and Tumeh’s findings will help scientists and clinicians develop and correctly prescribe the best treatment for patients with melanoma and other cancers. “The next big step is to classify the different types of patients who do not respond to pembrolizumab so we can develop drugs that can modulate the tumors in a way that makes them responsive to pembrolizumab,” said Tumeh. The findings are reported online today ahead of print in the journal Nature. This research was supported by Stand Up to Cancer and the National Institute of Health. Additional funding was provided by the UCLA Jonsson Comprehensive Cancer Center through philanthropy and other sources.